This artist has been identified as Marino di Sirissea or Marinus de Seeu, a painter from Reymerswaele mentioned by the biographers Guicciardini and Karel van Mander. He may also have been the artist from Zeeland named Moryn Claessone who registered in the guild of Saint Luke in Antwerp in 1509 as an apprentice stained-glass maker. If this is the case his date of birth should be located around 1490. His father was probably Claes van Ziericsee, a painter registered in that guild in 1475. 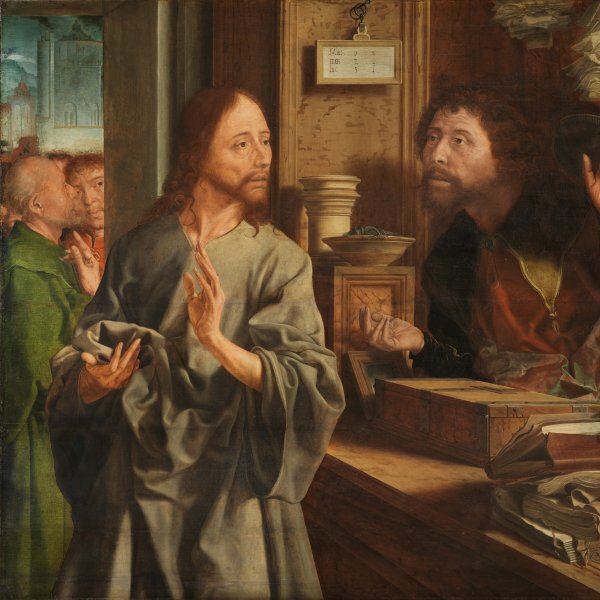 Together with the followers of Quinten Massys, Marinus van Reymerswaele was one of a group of 16th-century Dutch artists who specialised in genre scenes and his most frequently depicted subjects were those of tax collectors, money-changers and merchants. Among his most important works are The Money-changer and his Wife (Museo Nacional del Prado, Madrid), of which various versions are known, and The Tax Collectors (National Gallery, London), which is known in more than twenty-five variants, some of them by collaborators and apprentices. These works, all imbued with a satirical tone, can be read as critiques of corruption and greed. Van Reymerswaele also painted religious subjects of which his first Saint Jerome (Museo Nacional del Prado, Madrid) dates from 1521, while he was probably the first Netherlandish artist to depict the Calling of Saint Matthew. In his versions of that subject Van Reymerswaele depicted Matthew as a usurer in what would become his most popular subject. It is still unclear whether Van Reymerswaele can be identified as the “Marinus Claesson, native of Romerswael” who was tried in the city of Middelburg on 23 June 1567 and sentenced for his participation in the iconoclastic uprising in Westmonsterkerk in 1566.